"Obverse" redirects here. For the concept in logic, see Obversion. For the book publisher, see Obverse Books. 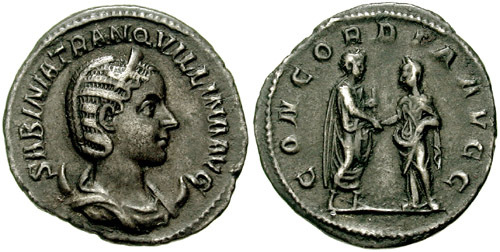 Roman imperial coin, struck c. 241, with the head of Tranquillina on the obverse, or front of the coin, and her marriage to Gordian III depicted on the reverse, or back side of the coin, in smaller scale; the coin exhibits the obverse –"head", or front –and reverse –"tail", or back –convention that still dominates much coinage today. A coin is a small, flat, round piece of metal or plastic used primarily as a medium of exchange or legal tender. They are standardized in weight, and produced in large quantities at a mint in order to facilitate trade. They are most often issued by a government. In fields of scholarship outside numismatics, the term front is more commonly used than obverse, while usage of reverse is widespread. 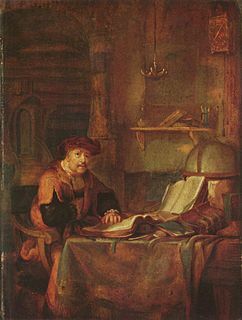 The scholarly method or scholarship is the body of principles and practices used by scholars to make their claims about the subject as valid and trustworthy as possible, and to make them known to the scholarly public. It is the methods that systemically advance the teaching, research, and practice of a given scholarly or academic field of study through rigorous inquiry. Scholarship is noted by its significance to its particular profession, and is creative, can be documented, can be replicated or elaborated, and can be and is peer-reviewed through various methods. Numismatics is the study or collection of currency, including coins, tokens, paper money and related objects. While numismatists are often characterised as students or collectors of coins, the discipline also includes the broader study of money and other payment media used to resolve debts and the exchange of goods. Early money used by people is referred to as "Odd and Curious", but the use of other goods in barter exchange is excluded, even where used as a circulating currency. The Kyrgyz people used horses as the principal currency unit and gave small change in lambskins; the lambskins may be suitable for numismatic study, but the horses are not. Many objects have been used for centuries, such as cowry shells, precious metals, cocoa beans, large stones and gems. The equivalent terms used in codicology, manuscript studies, print studies and publishing are "recto" and "verso". Codicology is the study of codices or manuscript books written on parchment as physical objects. It is often referred to as 'the archaeology of the book', concerning itself with the materials, and techniques used to make books, including their binding. A manuscript was, traditionally, any document that is written by hand -- or, once practical typewriters became available, typewritten -- as opposed to being mechanically printed or reproduced in some indirect or automated way. More recently, the term has come to be understood to further include any written, typed, or word-processed copy of an author's work, as distinguished from its rendition as a printed version of the same. Before the arrival of printing, all documents and books were manuscripts. Manuscripts are not defined by their contents, which may combine writing with mathematical calculations, maps, explanatory figures or illustrations. Manuscripts may be in book form, scrolls or in codex format. Illuminated manuscripts are enriched with pictures, border decorations, elaborately embossed initial letters or full-page illustrations. A document should be at least 75 years old to be considered a manuscript. On a Tetradrachma of Athens, struck c. 490 BC, the head of Athena, (left), is regarded as the obverse because of its larger scale and because it is a portrait head; the entire owl is depicted in a smaller scale on the reverse. Generally, the side of a coin with the larger-scale image will be called the obverse (especially if the image is a single head) and, if that does not serve to distinguish them, the side that is more typical of a wide range of coins from that location will be called the obverse. Following this principle, in the most famous of ancient Greek coins, the tetradrachm of Athens, the obverse is the head of Athena and the reverse is her owl. Similar versions of these two images, both symbols of the state, were used on the Athenian coins for more than two centuries. The history of ancient Greek coinage can be divided into four periods, the Archaic, the Classical, the Hellenistic and the Roman. The Archaic period extends from the introduction of coinage to the Greek world during the 7th century BC until the Persian Wars in about 480 BC. The Classical period then began, and lasted until the conquests of Alexander the Great in about 330 BC, which began the Hellenistic period, extending until the Roman absorption of the Greek world in the 1st century BC. The Greek cities continued to produce their own coins for several more centuries under Roman rule. The coins produced during this period are called Roman provincial coins or Greek Imperial Coins. The tetradrachm was an Ancient Greek silver coin equivalent to four drachmae. In Athens it replaced the earlier "heraldic" type of didrachms and it was in wide circulation from c. 510 to c. 38 BC. 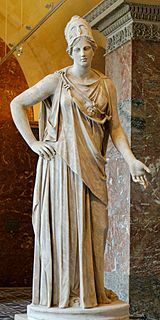 Athena or Athene, often given the epithet Pallas, is an ancient Greek goddess associated with wisdom, handicraft, and warfare, who was later syncretized with the Roman goddess Minerva. Athena was regarded as the patron and protectress of various cities across Greece, particularly the city of Athens, from which she most likely received her name. She is usually shown in art wearing a helmet and holding a spear. Her major symbols include owls, olive trees, snakes, and the Gorgoneion. In the many republics of ancient Greece,  such as Athens or Corinth, one side of their coins would have a symbol of the state, usually their patron goddess or her symbol, which remained constant through all of the coins minted by that state, which is regarded as the obverse of those coins. The opposite side may have varied from time to time. In ancient Greek monarchical coinage, the situation continued whereby a larger image of a deity, is called the obverse, but a smaller image of a monarch appears on the other side which is called the reverse. Corinth is an ancient city and former municipality in Corinthia, Peloponnese, which is located in south-central Greece. Since the 2011 local government reform it is part of the municipality of Corinth, of which it is the seat and a municipal unit. It is the capital of Corinthia. A deity is a supernatural being considered divine or sacred. The Oxford Dictionary of English defines deity as "a god or goddess ", or anything revered as divine. C. Scott Littleton defines a deity as "a being with powers greater than those of ordinary humans, but who interacts with humans, positively or negatively, in ways that carry humans to new levels of consciousness, beyond the grounded preoccupations of ordinary life". In the English language, a male deity is referred to as a god, while a female deity is referred to as a goddess. 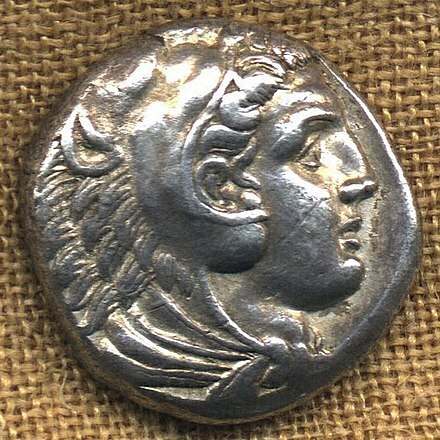 Obverse of the tetradrachm of Alexander the Great, intended to be seen as a deity, wearing the attributes of the hero, Heracles/Hercules. 325 BC. In a Western monarchy, it has been customary, following the tradition of the Hellenistic monarchs and then the Roman emperors, for the currency to bear the head of the monarch on one side, which is almost always regarded as the obverse. This change happened in the coinage of Alexander the Great, which continued to be minted long after his death. After his conquest of ancient Egypt, he allowed himself to be depicted on the obverse of coins as a god-king, at least partly because he thought this would help secure the allegiance of the Egyptians, who had regarded their previous monarchs, the pharaohs, as divine. The various Hellenistic rulers who were his successors followed his tradition and kept their images on the obverse of coins. A movement back to the earlier tradition of a deity being placed on the obverse occurred in Byzantine coinage, where a head of Christ became the obverse and a head or portrait (half or full-length) of the emperor became considered the reverse. The introduction of this style in the gold coins of Justinian II from the year 695 provoked the Islamic Caliph, Abd al-Malik, who previously had copied Byzantine designs, replacing Christian symbols with Islamic equivalents, finally to develop a distinctive Islamic style, with just lettering on both sides of their coins. This script alone style then was used on nearly all Islamic coinage until the modern period. 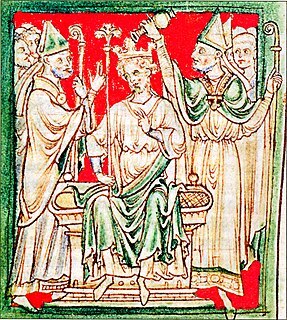 The type of Justinian II was revived after the end of Iconoclasm, and with variations remained the norm until the end of the Empire. Without images, therefore, it is not always easy to tell which side will be regarded as the obverse without some knowledge. After 695 Islamic coins avoided all images of persons and usually contained script alone. The side expressing the Six Kalimas (the Islamic profession of faith) is usually defined as the obverse. A convention exists typically to display the obverse to the left (or above) and the reverse to the right (or below) in photographs and museum displays, but this is not invariably observed. The form of currency follows its function, which is to serve as a readily accepted medium of exchange of value. Normally, this function rests on a state as guarantor of the value: either as trustworthy guarantor of the kind and amount of metal in a coin, or as powerful guarantor of the continuing acceptance of token coins. Traditionally, most states have been monarchies where the person of the monarch and the state were equivalent for most purposes. For this reason, the obverse side of a modern piece of currency is the one that evokes that reaction by invoking the strength of the state, and that side almost always depicts a symbol of the state, whether it be the monarch or otherwise. If not provided for on the obverse, the reverse side usually contains information relating to a coin's role as medium of exchange (such as the value of the coin). Additional space typically reflects the issuing country's culture or government, or evokes some aspect of the state's territory. Regarding the euro, some confusion regarding the obverse and reverse of the euro coins exists. Officially, as agreed by the informal Economic and Finance Ministers Council of Verona in April 1996, and despite the fact that a number of countries have a different design for each coin, the distinctive national side for the circulation coins is the obverse and the common European side (which includes the coin value) is the reverse. This rule does not apply to the collector coins as they do not have a common side. A number of the designs used for obverse national sides of euro coins were taken from the reverse of the nations' former pre-euro coins. Several countries (such as Spain and Belgium) continue to use portraits of the reigning monarch; while the Republic of Ireland continues to use the State Arms, as on its earlier issues. the other side, on which the date appeared, was regarded as the reverse. the side without the date is regarded as the obverse. A left-facing portrait of Edward VIII would have broken tradition. Following ancient tradition, the obverse of coins of the United Kingdom (and predecessor kingdoms going back to the middle ages) almost always feature the head of the monarch. By tradition, each British monarch faces in the opposite direction of his or her predecessor; this is said to date from 1661, with Charles II turning his back on Oliver Cromwell. Hence, George VI faced left and the present Queen faces right. The only break in this tradition almost occurred in 1936 when Edward VIII, believing his left side to be superior to his right, insisted on his image facing left, as his father's image had. No official legislation prevented his wishes being granted, so left-facing obverses were prepared for minting. Very few examples were struck before he abdicated later that year, but none bearing this portrait ever were issued officially. When George VI acceded to the throne, his image was placed to face left, implying that, had any coins been minted with Edward's portrait the obverses would have depicted Edward facing right and maintained the tradition. 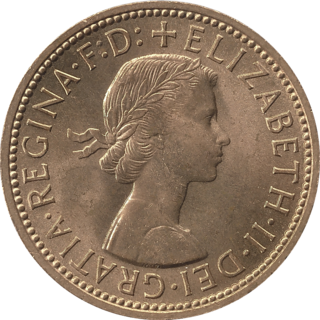 Current UK coinage features the following abbreviated Latin inscription: D(ei) G(ratia) REG(ina) F(idei) D(efensor) ( By the Grace of God, Queen Defender of the Faith ). Earlier issues, before 1954, included BRITT(anniarum) OMN(ium) (of all the Britains –that is, Britain and its dominions) and before 1949 IND(iae) IMP(erator) ( Emperor of India ). The United States specifies what appears on the obverse and reverse of its currency. The specifications mentioned here imply the use of all upper-case letters, although they appear here in upper and lower case letters for the legibility of the article. US dollar coin, with the obverse side showing Susan B. Anthony, the words "Liberty" and "In God We Trust", and the year 1979; the reverse side shows the words "One Dollar", "United States of America", and "E Pluribus Unum", and an eagle carrying a laurel branch.
" E Pluribus Unum "
Words (not digits) expressing the name or assigned value of the item, e.g., "Quarter Dollar", "One Dime", "Five Cents"
The words expressing assigned value of the coin, "Quarter Dollar"
Look up obverse or reverse in Wiktionary, the free dictionary. Wikimedia Commons has media related to Obverses . An ancient Greek currency unit issued by many Greek city states during a period of ten centuries, from the Archaic period throughout the Classical period, the Hellenistic period up to the Roman period under Greek Imperial Coinage. Three modern Greek currencies, the first introduced in 1832 and the last replaced by the euro in 2001. The euro did not begin circulating until 2002 but the exchange rate was fixed on 19 June 2000, with legal introduction of the euro taking place in January 2002. Byzantine currency, money used in the Eastern Roman Empire after the fall of the West, consisted of mainly two types of coins: the gold solidus and a variety of clearly valued bronze coins. By the end of the empire the currency was issued only in silver stavrata and minor copper coins with no gold issue. The history of coins extends from ancient times to the present, and is related to economic history, the history of minting technologies, the history shown by the images on coins, and the history of coin collecting. Coins are still widely used for monetary and other purposes. There have been three sets of coins in Ireland since independence. In all three, the coin showed a Celtic harp on the obverse. The pre-decimal coins of the Irish pound had realistic animals on the reverse; the decimal coins retained some of these but featured ornamental birds on the lower denominations; and the euro coins used the common design of the euro currencies. 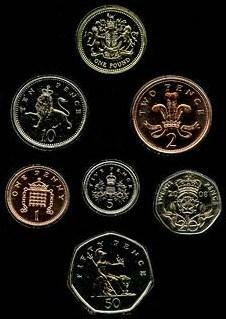 The pre-decimal and original decimal coins were of the same dimensions as the same-denomination British coins, as the Irish pound was in currency union with the British pound sterling. British coins were widely accepted in Ireland, and conversely to a lesser extent. In 1979 Ireland joined the Exchange Rate Mechanism and the Irish pound left parity with sterling; coin designs introduced after this differed between the two countries. Aksumite currency was coinage produced and used within the Kingdom of Aksum centered in present-day Eritrea and the Tigray Region of Ethiopia. 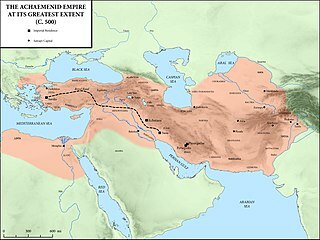 Its mints were issued and circulated from the reign of King Endubis around AD 270 until it began its decline in the first half of the 7th century. During the succeeding medieval period, Mogadishu currency, minted by the Sultanate of Mogadishu, was the most widely circulated currency in the Horn of Africa. Coins of the Achaemenid Empire were issued from 520 BCE-450 BCE to 330 BCE. The Persian daric was the first gold coin which, along with a similar silver coin, the siglos, represented the bimetallic monetary standard of the Achaemenid Persian Empire which has continued till today. It seems that before then, a continuation of Lydian coinage under Persian rule was highly likely. Achaemenid coinage includes the official imperial issues, as well as coins issued by the Achaemenid governors (Satraps), such as those stationed in ancient Asia Minor. ↑ Sakoulas, Thomas. "Ancient Greece". www.ancient-greece.org. ↑ Commission Recommendation of 29 September 2003 on a common practice for changes to the design of national obverse sides of euro circulation coins (PDF), OJ L 264, 2003-10-15, pp. 38–39; EU doc. nr. C(2003) 3388.